Thats Amazing Cleaning Services, Carpet Cleaners London, Epsom, Sutton, Surrey, Kingston, Croydon & Upholstery Cleaning in South East. It's absolutely true. We will give you £10 for each recommendation of our services to your family or friends. 3M Scotchguard can be applied to almost any fabric in your home. Once applied it produces an invisible layer of protection for the fabric. This protection can help stains from becoming a permanent eyesore. The barrier resists moisture. If you have a spill it gives you time to to get it cleaned up without it soaking into the material. Having this protective coating will help reduce the wear and will repel stains! If you're not sure what the problem is, why not send us a picture via email or smart phone. We offer free advice and expertise over the phone. So give us a call or fill out the form and we'll call you right back. Thats Amazing Cleaning Services are experts in providing professional domestic and commercial carpet cleaning, upholstery cleaning, end of tenancy cleaning, rug cleaning, mattress cleaning and 'on site' curtain and blind cleaning. We have earned a solid reputation for quality services and customer satisfaction since 1994. Over this time we have cleaned for many satisfied domestic and commercial customers in London, Surrey and surrounding counties. We are a vibrant and exciting cleaning company and we are proud of our exemplary achievement in a very competitive market place. Thats Amazing Cleaning Services has built a reputation for its dependability, honesty, professionalism and advice in all aspects of its business. Our continuing growth is built on our commitment to providing consistently high levels of service which exceed our customer's expectations. Our mission is to provide our consumers with effective, professional and dependable cleaning services with the latest information on keeping their homes safe and healthy for their families. We utilise all the latest and best cleaning methods so that we can provide the perfect and deepest clean for your premises or items. We aim to give 100% total satisfaction in every job we complete. Our cleaners and technicians have been trained to the highest industry standard by the NCCA, Prochem and IICRC. All our staff are CRB checked, carry ID badges and are always presented in Thats Amazing Cleaning Services uniform. 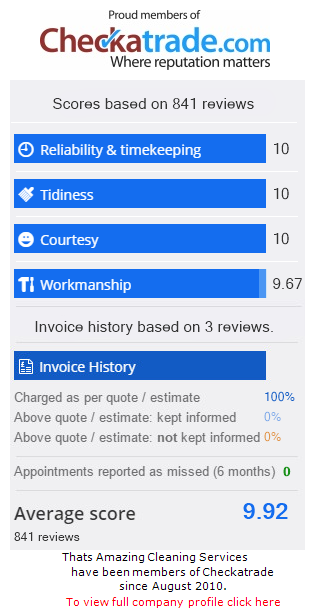 Thats Amazing Cleaning Services are proud members The National Carpet Cleaners Association (NCCA) and Checkatrade where we have over 600 feedback reports with an average score of 9.9 out of 10. 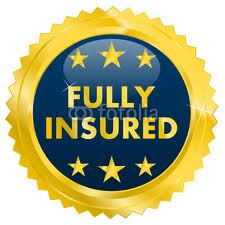 We are fully insured and all our work comes with an iron clad, risk free guarantee. If you are unhappy for whatever reason we will come back and re-clean free of charge. If you're still not satisfied we will refund your money. We can provide instant quotations over the phone or by email for all domestic carpet, upholstery, rug, mattress and curtain cleaning jobs. Whether you have a small stain or need your home or place of work cleaned we can help. 8am till 8pm, 7 days a week. Freephone 0800 023 2053 or click here to contact us. Thats Amazing Cleaning Services offers excellent value for money. Remember to ask for your 10% discount if you are over 60 years old or you are a returning customer of ours (terms & conditions apply). Minimum order £40.00. Prices do not include VAT. Price terms: All prices are NOT fixed, they are 'from' (excluding Rugs ). These prices are based on an average sized property or item and may vary according to your room sizes, amount of stairs and cleaning requirements. Parking fees and congestion charge will be added to your final bill if required. *If you require a collection and delivery service for Rug Cleaning there will be an additional surcharge. Payment terms: We accept cash, debit, credit cards and cheques only with a guarantee card. Receipts are always issued to you after payment. Cancellation: 24 hour's notice is required to cancel a booking or a £40.00 callout charge will apply. See cancellation terms for more details. Thats Amazing Cleaning Services offer a no-quibble refund if you're not satisfied. Each job comes with an iron-clad, risk-free, money-back guarantee. 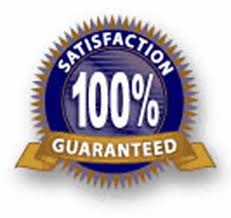 If you are not 100% happy for any reason we will return and re-clean free of charge. If you are still unhappy with the cleaning results after this we will refund your money (see terms & conditions). All of our cleaners are covered by our full public liability cover provided by our insurers who are underwritten by Lloyds of London. Our insurance policy will cover any accidental damages to your property caused by any of our cleaners up to 5 million pounds.